Tone's dynamic playing combined with Doane's great rock feel, give this music of the masters an entirely new presentation. The singing sustain of multiple razor edged electric guitars, the monster rock backbeat of Jethro Tull drummer Doane Perry and The Moonlight Sonata? 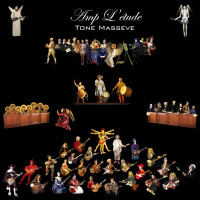 Yes, This mash-up is the concept behind Tone Masseve's album Amp L'étude. Classical pieces? Yes, but these are not the dry, conventional versions we've all heard before. The album vividly brings these compositions to life with a new and powerful sound. View twelve 30 second sample videos.